Napoleon in America opens with a knock on a door, disturbing Sir Hudson Lowe at his toilet. Though that particular door on St. Helena did not sport a door knocker inspired by the Duke of Wellington, many doors in England did. Door knockers were a common feature of 19th-century life, until they were replaced by the electric doorbell. The Wellington Door Knocker was invented by David Bray, an ironmonger located at 16 Cranbourn Street in Leicester Square, London. Bray first offered the door knocker for sale in May 1814, shortly after Napoleon’s exile to Elba. Thus Bray was honouring the Duke of Wellington’s victories in Spain and Portugal, rather than his subsequent triumph in the Battle of Waterloo. 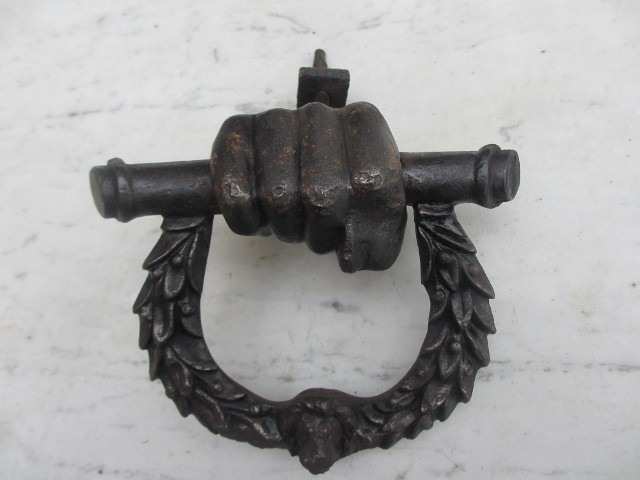 This last victory, in June 1815, added to the door knocker’s popularity. The Duke of Wellington’s death, in 1852, generated another spike in the sale of Wellington memorabilia, including the Wellington Door Knocker. By the late 1800s, however, door knockers had gone out of fashion, thanks to the availability of electric doorbells. Door bells are a relatively modern invention and have only come into general use in London since the introduction of the electric button. Down to a quarter of a century ago the only modish means of summoning domestics to attend the house door were knockers, and in the fashionable districts, as well as in those populated by the humbler classes, every house door was adorned with a knocker of a more or less ornate character. The bells, such as they were, were reserved exclusively for the servants’ area and for the kitchen use, and in those days anybody possessed of social pretensions would have considered it as an infraction of dignity and self-respect to announce his or her presence at the entrance otherwise than by means of the knocker. The knocking went on all day long and constituted so important a feature of metropolitan existence that it is difficult to realise how in the world it can have been so easily dispensed with and banished from the doors of all save the aristocracy. Thus, if there was a person who had died in the house, the knocker was ornamented with a bow of crape; if a birth had taken place a white glove on the knocker announced the fact, while if any one was killed the knocker was swathed in felt, and a marriage was proclaimed by a bunch of flowers fastened to the knocker. Door knockers were a common object of theft, and not only by the lower classes. Knockers…constituted an important feature of sport and entertainment to the youth of the metropolis. Much of the watchfulness on the part of the police detailed for night duty was devoted to the preservation of the knockers from being stolen. Knocker-wrenching was a favourite form of diversion for rich and poor alike, and an aristocrat as well as shop boy looked upon the stolen knockers that constituted the trophies of his midnight prowess much in the same way as an Indian brave was wont to regard his collection of scalps. First and foremost among these knocker-wrenchers was Lord Charles Beresford, though he was run close by his brother, Lord ‘Bill.’ Some of the knockers were such large brass affairs, and were fastened so firmly to the doors, that they defied the efforts of the marauders. Of such a nature were the big bronze dolphins which serve as knockers to the doors of the town house of the Marquis of Bath, on the west side of Berkeley Square. Lord Charles had tried several times to wrench off these particular knockers, but without success. Determined not to be baffled, he hit upon another plan. Late one night he drove up with his intimate friend and chum in a hansom to the residence of Lord Bath. By the initiated the features of the cab driver might have been recognised as those of Lord Ribblesdale. As soon as the hansom halted, Lord Charles hopped out, carrying a stout rope. One end of this was attached to the knockers and the other to the body of the cab, the titled driver then being ordered to ‘whip up.’ This he did. The horse sprang forward and out came not only the knockers, but also the panels of the door. The decline of door knockers was accompanied by the loss of other adornments. If you would like to revive the door-knocking tradition with your own Wellington Door Knocker, visit Charles Graham Architectural Antiques and Fireplaces, who kindly provided permission to use the image at the top of this article (see product reference DF06). The Morning Post (London, England), May 19, 1814. The Morning Post (London, England), January 16, 1816. “Concerning Door-Knockers,” Daily Mail (London, England), July 2, 1896, p. 7. I love the comment that knockers were only to be found on the doors of distinguished people, generally indicating a taste for art and archaeology on the part of the owner of the mansion. Clearly the knockers were a sign of wealth of course, but also education and classiness. Given the door knockers I see installed on some fancy new homes (along with doorbells, of course), I think some homeowners are hoping knockers convey that message even today. I have a knocker, not a Wellington but a hefty bit of iron nevertheless. I also have a mechanical bell with a large handle which needs to be yanked with some force. I find that nowadays, many don’t know what the handle is for and finding no bell push button, set to with the knocker with far more effort than is required. Further to previous, my house also used to sport a life sized statue of Queen Victoria in a niche above the front door but that was removed during “modernisation” in the 1960s. Contrary to the impression my post may give, the house is a small cottage and was the home of the town mason. He used the building to show off his skills so it is fairly quirky but spoiled by the lack of appreciation of later owners. Your house sounds delightful, Philip. I’m glad it now has an owner who appreciates it. Very informative – and fun! Thank you. Thanks, Jen. Glad you liked it! You’re welcome. Glad you enjoyed the article. That is an old and impressive design of door knockers. Yes, it really makes a statement, doesn’t it. Hi! We found your website while trying to research an unusual door knocker we found. It appears to be missing a piece, but we cannot for the life of us figure out how it would have looked or worked originally. Hoping that this piques your interest and that you may be able to share some of your knowledge on the subject. Thank you! Thanks for contacting me, Tony. I’m not a door knocker expert, and thus not the best person to answer your question. I recommend getting in touch with Charles Graham (http://www.architecturalantiquesandfireplaces.co.uk/contact.php), who sells antique door knockers and is familiar with how they work. Good luck with yours! The knocking went on all day long and constituted so important a feature of metropolitan existence that it is difficult to realise how in the world it can have been so easily dispensed with and banished from the doors of all save the aristocracy.